My pals over at The Hired Guns recently took a few select folks on a cocktail sea cruise around Manhattan, and here are the invites! 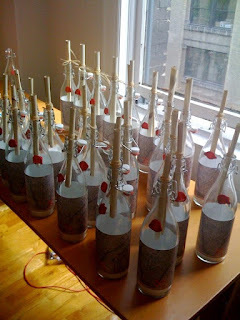 They took easy-to-find bottles, glued a copy of a vintage map on the front and rolled the the invitation through the opening for a clever invite that definitely grabbed people's attention. When I saw the paper portion of the invites, I suggested they go a step further and make the edges look weathered and rustic....sort of like the things we did in Cub Scouts. Now I'm sure there are other ways to do this (rip the edges and apply shoe polish, stain the paper with tea, and so on....), but I looked to my inner pyromaniac and burned all 40 or so pieces with a lighter myself. I didn't realize what a project I had taken on, let alone how much smoke I would create, prompting several office mates to "jump ship," and the janitorial staff to make an unexpected visit. Either way, I love the way they turned out. Note the little red wax seal on each bottle that gives them an even more personal touch. For more unique party ideas that won't break the bank, pick up The Find: The Housing Works Book of Decorating with Thrift Shop Treasures, Flea Market Objects, and Vintage Details at Borders, Barnes & Noble, Amazon or Powell's. Drifting off for the weekend! 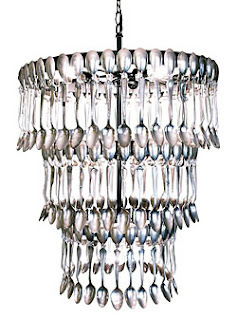 How can you not love this "spoondelier" made out of vintage silver-plate flatware from a company called Cake? It was featured in Home Accents Today as a highlight from the Atlanta Market, and I've searched high and low to find out more about this brand, but to no avail. I do know someone, however, who creates all kinds of crafty magic out of old flatware and vintage china pieces, and that would be Sharleen Reeder of Luticia Clementine's in my hometown of Independence, Mo. While this creation has a retail price tag of $1,500, according to Home Accents Today, I bet Sharleen could make something similar at a fraction of the price. She's already known for taking odd pieces of silverware and turning them into jewelry, fan pulls and miniature easels. Why, she's even been known to take teacups and their matching saucers and refashion them into gorgeous garden accessories. 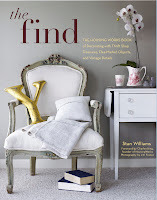 I featured Sharleen's talents in The Find: The Housing Works Book of Decorating With Thrift Shop Treasures, Flea Market Objects, and Vintage Details. When I interviewed her, she said it pains her to take an entire set of silver and cut it up into pieces for resale. "But I feel like if I can turn these things into somethign that people will actually use, then at least someone is enjoying in the home," Reeder says in The Find. Here's a photo that Bob Greenspan shot of Sharleen's work while we were photographing The Find. You can see that her bent-fork easel is a whimsical way to display photographs, business cards or even recipes. For more of Sharleen's charming handiwork, pick up your copy of The Find: The Housing Works Book of Decorating with Thrift Shop Treasures, Flea Market Objects, and Vintage Details at Borders, Barnes & Noble, Amazon or Powell's. Sonya at Dime Store Thrift is a sly gal. After weeks of chatting in the blogosphere about her own passion for thrift shopping and my giving her some tips for her vacation to the Kansas City area, she finally talked me into giving her an interview, and it was a doozey! I can't believe all the of the details that she dragged out of me! Read it here. So charming is Sonya, combined with my own gift of gab, that she, for the first time ever, finagled out of me the top-secret recipe for my famous pineapple upside-down cake. It's similar to the one featured in the Los Angeles Times, the one I made for Sharleen Reeder at Luticia Clementine's in Independence, Mo., the one for Yasmine McGrane of Maison Rêve in Mill Valley, Calif., the one for a Bastille Day party that The Vintage Laundress threw in Austin, and the one for the New York VIP dinner celebrating the launch of The Find: The Housing Works Book of Decorating With Thrift Shop Treasures, Flea Market Objects, and Vintage Details in May. Until this morning, I've never completely revealed how I make my cake. But it looks like the cat is out of the bag! I can no longer demure a request for my pineapple upside-down cake recipe. Thanks to Sonya, you can attempt your own version of my cake with the recipe here. But what I can tell you is that if I make a cake for you, you'll never know which version I used -- the boxed or the scratched. Like I told Sonya last night, many fancy folks have feasted on Betty Crocker and left not a crumb! For your own copy of The Find: The Housing Works Book of Decorating with Thrift Shop Treasures, Flea Market Objects, and Vintage Details head on over to Borders, Barnes & Noble, Amazon or Powell's. While I was thrifting my way through the streets of San Francisco a few weeks ago, I dropped into a Goodwill in Pacific Heights and was greeted right inside the door by this funny hodgepodge of guitars and ukuleles. It was an instant collection ripe for the picking. Provided you had the space, I imagine an entire walled filled with these stringed treasures, hung just as they are, or even painted -- all one color or a mixture of hues -- for a visual treat. These plucky items also made me think of a wall decorated with old tennis rackets that I relished when I was scouting locations a few summers back for The Find: The Housing Works Book of Decorating With Thrift Shop Treasures, Flea Market Objects, and Vintage Details. 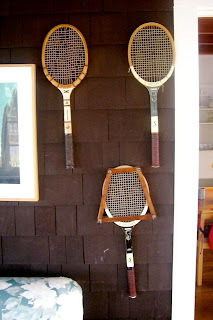 Hanging on the front porch of a beach cottage on the Fire Island community of Saltaire, a couple of the rackets had popped their guts, one was cracked and another was still hanging in its protective wooden frame. The rackets appeared as if they were just waiting to be grabbed and toted off to the tennis court for a neighborly, early-morning match. Maybe they had hung there so long that when newer technology finally replaced them, they maintained their place of honor. Or maybe the trio is purely decorative. Either way, they serve up a pleasing focal point in this dreamy, relaxed locale. For more images from Saltaire, pick up The Find: The Housing Works Book of Decorating with Thrift Shop Treasures, Flea Market Objects, and Vintage Details at Borders, Barnes & Noble, Amazon or Powell's. Writing The Find: The Housing Works Book of Decorating With Thrift Shop Treasures, Flea Market Objects, and Vintage Details was a pure labor of love. It truly means so much to me to hear from everyone who has been touched by its photos, its words and its mission. I am also deeply grateful for all of the talents featured in The Find. Each of them gave so freely gave of their time, their efforts and their creative energy. For without their gracious contributions, this book would never have been published. Then there are all the people who have purchased The Find, and all of my fans in the blogosphere who boost my morale every single day: you are true treasures who have become like cherished friends to me. I walked right into the shop, and there on a table among all the other gorgeous design books from around the world was The Find. I watched for a few minutes as shoppers flipped through its pages, and then went to the manager to ask if I could take a picture of my book on display. He said yes, but only if I signed the copies in the store. Of course, I had my brown, calligraphy pen on hand, and happily signed them all. 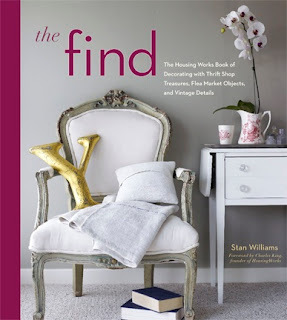 For your own copy of The Find: The Housing Works Book of Decorating with Thrift Shop Treasures, Flea Market Objects, and Vintage Details at Borders, Barnes & Noble, Amazon or Powell's. I'm so happy that Sonya from Dime Store Thrift met one of my most favorite people in the world, the creative Sharleen Reeder of Luticia Clementine's in Independence, Mo. Sharleen's wonderful talents are featured in The Find: The Housing Works Book of Decorating With Thrift Shop Treasures, Flea Market Objects, and Vintage Details. When I was in San Francisco a couple of weeks ago for a book signing at Maison Rěve for The Find: The Housing Works Book of Decorating With Thrift Shop Treasures, Flea Market Objects, and Vintage Details, my old friend with whom I was staying wanted to throw a cocktail party at the last minute. I whipped up a pineapple upside-down cake (You know I always travel with my pan, and the kind folks at Liberty Gold provide the pineapple!) and he made the sangria as I delved into his cabinets to see what he might have to spice up his presentation. One of the most important aspects of creating a simple, yet appealing tabletop is food arrangement. Here's one instance when it's absolutely okay to play with your food. Even flat breads, when fanned out creatively, look more appealing when served up with a simple humus dip atop a plastic, Christmas tray. And finally, repurposed objects can make an ordinary plate look fresh. I found this pale blue flower pot buried in one of my friend's cupboards and overflowed it with cherries in the middle of an array of store-bought cookies. 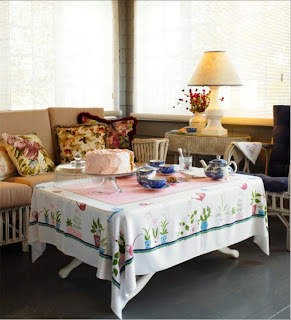 For more budget friendly party tips, pick up The Find: The Housing Works Book of Decorating with Thrift Shop Treasures, Flea Market Objects, and Vintage Details at Borders, Barnes & Noble, Amazon or Powell's. Today's unexpected use for everyday objects comesfrom Swiss designer Laura Pregger, via Design*Sponge. 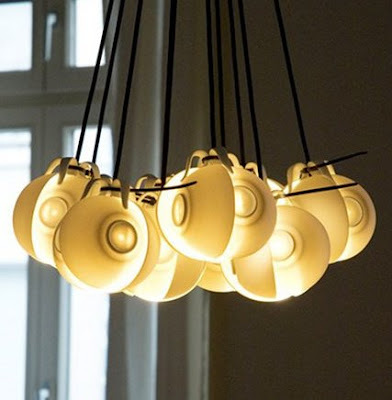 According to Design*Sponge, Laura is known for taking manufacturers' seconds and re-crafting them into new forms and purposes If you love the fanciful teacup chandelier like I do, click on Laura's link above to witness the chic lighting she makes out of bowls as well. For more ideas on how to repurpose common household discoveries, pick up The Find: The Housing Works Book of Decorating with Thrift Shop Treasures, Flea Market Objects, and Vintage Details atBorders,Barnes & Noble, Amazon or Powell's. While I was having a down-home brunch with old pals at the Blue Jay Café in San Francisco, I was struck by the ingenious wainscoting that was used along the walls. Made entirely out of louvered shutters, they face alternating directions, giving the wall a unique texture when viewed from different directions. You can almost imagine opening them all up to reveal a gorgeous landscape, but I am quite sure that if you did, you'd just see wall! For more thrifty fun, pick up The Find: The Housing Works Book of Decorating with Thrift Shop Treasures, Flea Market Objects, and Vintage Details at Borders,Barnes & Noble, Amazon or Powell's. The Find: Go! Go! Go! One of my favorite locations we photographed in The Find: The Housing Works Book of Decorating With Thrift Shop Treasures, Flea Market Objects, and Vintage Details, is Go-Go's Jane Wiedlin's downtown LA loft, decorated by my fabulous pals at Jonamor Décor. I love this location because it exudes Jane's quirky personality, lit by imagery from girlie pin-ups, space-aged objects and a lust for originality and humor. I also like the way she incorporated what could have been eyesores, like the columns that run through her space, and turned them into pleasing focal points. The column on the right was painted an intergalactic silver, and then ringed with metal shelves to show off her collection of pin-up cocktail glasses and retro barware. And oh, there's me standing in front of the fireplace made of river stone, crafted by the creative folks at Skellramics. Oh, she's got the beat! For more space-aged looks into Jane's space, pick up The Find: The Housing Works Book of Decorating with Thrift Shop Treasures, Flea Market Objects, and Vintage Details at Borders,Barnes & Noble, Amazon or Powell's. These days, I seem to be cast in a French theme as I consistently find items that remind me of my favorite place on earth: France. While perusing the Allemany Flea Market in San Francisco last week, I spied this trio of cardboard hand fans promoting Air France, and all the places it must have flown in the day. I sneaked one of these fanciful fans into The Vintage Laundress LeAnn Stephenson's Bastille Day themed Hooch Bag a few days ago. These fans reminded me of the first time I flew to France, on Air France, in 1985, on my way to a year of study at the University of Bordeaux. It was the first time I'd flown overseas, and I had to fly from Kansas City to New York's JFK, and change terminals to make my Air France flight. Once I entered the plane, it was glamour abound. Coupes of champagne, French flight attendants dressed in crisp uniforms, dinner menus, china plates and Paris! I was headed to Paris, where I would meet a group of fellow students who would spend a week in the City of Lights before snaking down south through the Loire River Valley and finally reaching our destination, Bordeaux. It was one of the best years of my life, and I visit France as often as I can. But for now, I'll take one of the fans I saved for myself, and dream....breezily. For more dreamy inspiration, pick up The Find: The Housing Works Book of Decorating with Thrift Shop Treasures, Flea Market Objects, and Vintage Details at Borders, Barnes & Noble, Amazon or Powell's. It is truly a gift to spend quality time with friends, old and new. 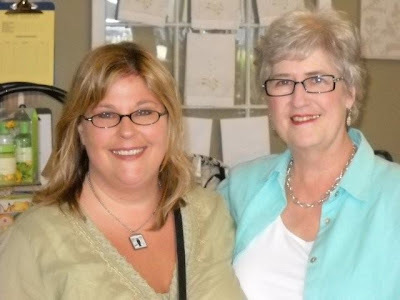 Here's a photo of me with one of my dearest and oldest friends, Deb Kelt, at the fabulous get-together thrown by my new friend LeAnn Stephenson, The Vintage Laundress, and taken by another of my new friends, her daughter, Olivia Stephenson. For more pictures of me and my new friends in Austin, Texas, take a gander at The Vintage Laundress. When putting together one of my Hooch Bags, I sort of let the thrift gods lead the way. This bag is a very special one, made for LeAnn Stephenson, The Vintage Laundress, as a hostess gift for putting together a tremendous Bastille Day party at Uptown Modern in Austin, Texas....and for being such a wonderful, new friend. I didn't have my normal cache of funny money, candy cigarettes or discrete nips, but I didn't let that stop me as I perused the Allemany Flea market in San Francisco. First, the blue suede bag appeared, then the fan fron Air France, and he vintage Parisian postcards and finally the French books. The hilarious vintage nylons showed up in a Goodwill in Austin, and my friend Deb Kelt donated the French dictionary and the red and blue ribbon. Et Voilà! A bag fit to cause a revolution! Nothing makes me happier than seeing unusual objects gathered in the garden, especially when they are whimsically placed with joy and wit -- and even more so when I find them in the works of good friends. So this morning in the hotter-than-Hades Austin sun, I took my camera into the garden of my old pals Deb Kelt and Charles Hancock, and couldn't have been more delighted by the finds on display there -- the interior of an old fan, a wooden croquet set, an industrial air vent, a window frame, two sun-bleached lovebirds that remind me of the ones that sat on my parents' coffee table. Most were street discoveries, eloquently showing how other people's castoffs can instantly become another's treasure. Fabulous & Frugal Fun: Bright Eyed and Bushy Tailed! 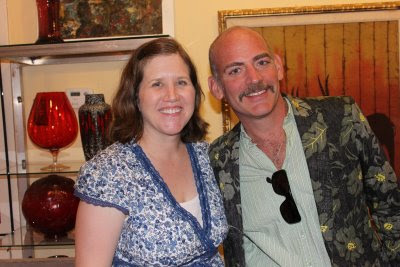 Last night's Bastille Day blowout at Austin's Uptown Modern hosted by LeAnn Stephenson, The Vintage Laundress, was one of the most amazing nights on my book tour. She went all out with delicious snacks, and created a guest list of wonderful people to celebrate The Find: The Housing Works Book of Decorating With Thrift Shop Treasures, Flea Market Objects, and Vintage Details. Here's a snap of me with LeAnn and Jean Heath, who so graciously opened the doors to her fantastic Uptown Modern, an Austin emporium for amazing mid-century finds, for our get-together. What makes this photo even more special is that it was taken by LeAnn's incredibly talented daughter, Olivia. I just got off the red-eye flight from San Francisco to Houston, en route Austin for tonight's blowout at Uptown Modern, hosted by The Vintage Laundress, to celebrate The Find: The Housing Works Book of Decorating With Thrift Shop Treasures, Flea Market Objects, and Vintage Details. My day has already started out with a sign of things to come: Redbook's August issue features The Find on page 140! Since my body still wants to sleep, I'll share with you some of the things it might have been dreaming about -- like Yasmine McGrane's latest finds for Maison Rêve. Hey, it is Bastille Day, so I'm dreaming in French! For more about Yasmine and her Maison Rêve, pick up The Find: The Housing Works Book of Decorating with Thrift Shop Treasures, Flea Market Objects, and Vintage Details atBorders, Barnes & Noble, Amazon or Powell's. The Object of My Desire: Vive la France! In preparation for my arrival in Austin, Texas, tomorrow, I hit the Allemany Flea Market in San Francisco in hopes of spying some French inspiration for the Bastille Day celebration that The Vintage Laundress and Uptown Modern are throwing to fête The Find: The Housing Works Book of Decorating With Thrift Shop Treasures, Flea Market Objects, and Vintage Details. Et voilà! Les dieux de "thrift" était très généreux! Not only did I find some other surprises that I'll share later, but I found this bundle of unused French postcards from the 1950s and 1960s that remind me of one of my favorite places on earth! A demain! Gros bisous à tous! Saturday Surprises: She Did It! When bringing anything new into your life, I firmly believe in focusing only on what you love, especially when shopping for vintage and thrift treasures. This concept was fully affirmed the other night with my friends at Maison Rêve as we gathered in Mill Valley to celebrate The Find: The Housing Works Book of Decorating With Thrift Shop Treasures, Flea Market Objects, and Vintage Details. For if you only decorate your home with items that speak to your heart, you will always make room, even if it means passing a no-longer-wanted object along to a friend, donating it to a cause, or in the worse case, putting it in the recycling bin. 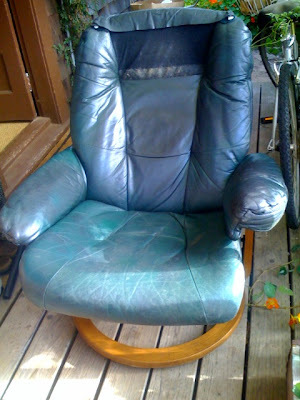 My new friend Michelle at Maison Rêve finally got up the courage to get rid of what she called "the ugly green nightmare" reclining chair that has haunted her space for much too long. I'm certain that a heart-warming replacement will arrive soon! Imagine my surprise and delight as I crossed over the Golden Gate Bridge, headed into Mill Valley breezily arrived at my destination, Maison Rêve, and the see, all the way from the parking area, my name written on the window, inviting guests to a book signing of The Find: The Housing Works Book of Decorating With Thrift Shop Treasures, Flea Market Objects, and Vintage Details. Some say they dream of seeing their name in lights, but paint is quite fine by me! Once again, my pals at Liberty Gold sent the fruit-of-honor for the pineapple upside-down cake I made for my friends at Mill Valley, California's Maison Rêve last night when they fêted The Find: The Housing Works Book of Decorating With Thrift Shop Treasures, Flea Market Objects, and Vintage Details. The celebration was most certainly warrented, since its the vision of Yasmine McGrane, Maison Rêve creator, whose work is featured on The Find's cover. Her inspiration for creating a life you love is infectious! My morning started by searching for just the right platter on which to serve my cake, and in a few minutes found it at a thrift store not far from where I'm staying in Pacific Heights. I saw lots of options for under $5, but settled on a swirled glass, raised dish with a golden trim. Making the cake was easy enough, since I travel with a vintage cake pan, and, as usual, it was a hit! I owe the recipe to several people who asked at last night's event. I have tons of pictures from the event, which I'll share later, and have made so many new friends. Thank you Maison Rêve! For more about Yasmine and her Maison Rêve, pick up The Find: The Housing Works Book of Decorating with Thrift Shop Treasures, Flea Market Objects, and Vintage Details at Borders, Barnes & Noble, Amazon or Powell's. Sometimes a boat is a bus and a guy is a girl, especially if it's July 4, or a day they call The Invasion in the Fire Island community of The Pines. It's a festive day when people dress in wigs and heels, board a ferry in Cherry Grove, and "invade" The Pines. This year's ferry was preceded by a pink square that mysteriously appeared on the horizon across the bay. As it got closer, we realized that some pals of ours had shrink-wrapped their houseboat, painted it pink and turned it into a scene from "Priscilla Queen of the Desert," where everybody aboard dressed their parts. One of my favorite costumes is this colorful dress made out of flip-flops. Now there's a thrifty shift for you! If you happen to be near Mill Valley in the San Francisco Bay Area tonight, July 9, come see me from 6 p.m. to 8 p.m. at Maison Rêve where we'll be celebrating The Find: The Housing Works Book of Decorating With Thrift Shop Treasures, Flea Market Objects, and Vintage Details. 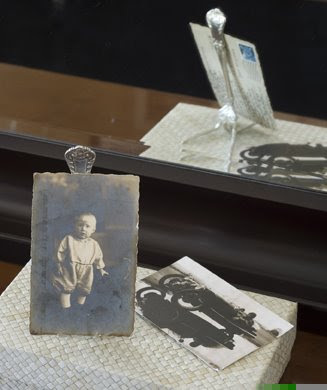 Empty frames are such common finds at flea markets and garage sales that they are often overlooked when they don't have their center of attraction. 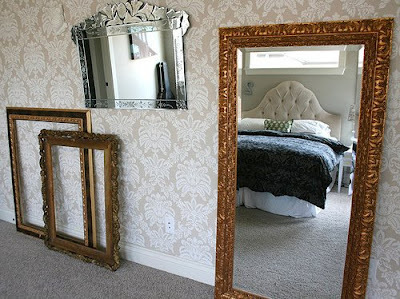 But a gorgeous frame is a gorgeous frame, encasing a painting or mirror, or not. I love the mysterious yet whimsical effect that Simply Grove's Kristen Grove of Boise, Idaho, achieved when she leaned two empty ornate frames against her bedroom wall among a set of fabulous mirrors. For more unexpected uses for everyday discoveries, pick up The Find: The Housing Works Book of Decorating with Thrift Shop Treasures, Flea Market Objects, and Vintage Detailsat Borders, Barnes & Noble, Amazon or Powell's. Next, you'll note the goregeous pink birthday cake. You know I love baking cakes, but this one was needed at such short notice that I had to buy one on the fly, along with my version of "catering" for a crew of six before hitting the road. And then there is the location: the dreamy Fire Island community of Saltaire, where a siren blows every day to remind you it's 12 noon, bicycles on the boardwalk are the only rolling form of transportation, and the lazy days of summer always come to an end much too soon. Read more about enchanting Saltaire in The Find: The Housing Works Book of Decorating with Thrift Shop Treasures, Flea Market Objects, and Vintage Details at Borders, Barnes & Noble, Amazon or Powell's. NOTE: I wrote this last summer when the Luxor was still docked on Fire Island. 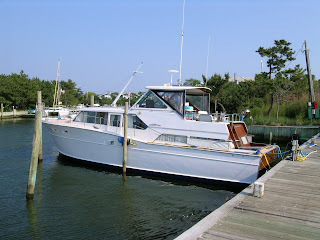 This past weekend while spending time on a friend's boat there made me think of how much I enjoyed that old boat, which sadly, is resting in Sayville this season. When I tell people I've spent nearly the past 10 summers on Fire Island aboard a 1966, 44-foot, wooden Chris Craft Sea Skiff called “The Luxor,” they quite often don’t believe me. “How come I’ve never been invited out,” is the common response, even among my closest friends. “The Luxor” spends most of her life docked either in Sayville, L.I., or in the Pines, since taking her out for an expedition can prove trying, to say the least. We’ve lost radar reception in huge patches of fog, had one or even both engines go out, usually with a gigantic ferry on our tail. The phone and TV reception is almost non-existent, and forget about jumping on-line with an Internet connection. Oh, and the space is cramped. I sometimes compare living on "The Luxor" with that of camping on a floating RV. However, despite her thirst for expensive gas (she holds nearly 400 gallons and gobbles it by the second when she’s cruising), her age spots and tight quarters, I can’t imagine spending a summer without her. On weekends, I count the days until it’s time to head out to the island, remove her canopy and perch dreamily on her deck, watching the trees quivering in the breeze and deer daintily nibbling the greenery of a neighboring house’s landscaping. Just like the fleeting summer, we know there’ll be a day when “The Luxor” is no more. I hope never to witness that moment, but when it does, she’ll take her place among my fondest summer memories: the sensation of that first dip in the Mediterranean, the taste of my Grandpa Williams's Arkansas tomatoes, family trips to Florida and Tennessee packed into a 1977 Caprice Classic, a pig roast and a homemade, Fourth of July fireworks display in Grandma Churchill’s yard, or snapping old-time pictures at my summer job at Worlds of Fun. These summer memories, more vivid in my mind than any detailed photograph, are ones that I’ll forever cherish. Anytime I'm invited to a party, especially if it's one celebrating me or my book The Find: The Housing Works Book of Decorating With Thrift Shop Treasures, Flea Market Objects, and Vintage Details, I always bring a hostess gift. In last week's case, it was a hosts' gift, plural, when John Bartlett and John Esty threw a book signing party at JB's Greenwich Village store. My hostess gift of late has been a home-made pineapple upside-down cake, but this time a garage-sale take of $5.25, (See July 1's post, here) inspired a gift more appropriate for the gracious hosts. At one garage sale I spied a bag of Cub Scout pins and badges, two woggles (Those are the rings you wear around the scarf), and a Wolf Manual and a Bear Manual, both from the 1950s. I love the challenge of whipping up a hostess gift at the last minute, and I've never been disappointed. I always say the thrift gods will provide, and at this garage sale, they most certainly did. So once I got back to New York, I looped the woggles through some ribbon, and tied it around the two manuals -- the Wolf facing one side, the Bear on the other. Then I glued some of the badges on top. One of my favorites is the one that says "Be Prepared." I think that's good advice for thrift shopping, since you never know what you'll discover. For more thrifty ideas, pick up The Find: The Housing Works Book of Decorating with Thrift Shop Treasures, Flea Market Objects, and Vintage Details at Borders, Barnes & Noble, Amazon orPowell's. Reuse & Repurpose: Let 'Er Rip!